This year's Google Summer of Code started roughly a week ago and we thought it might be nice to let them introduce themselves a bit before they start writing a few posts of their own. Some of the projects aren't as visual as others so there might be less posts or screenshots from the students doing them, but we'll keep you updated now and then nonetheless. Anyway, enough with introducing the introduction, let's hear what they say themselves. My name is Csaba. You can find me in IRC / forum with the nick name elath. I have the honor to create a Track Editor for SuperTuxKart, and I will try my best to bring a useful tool for you. My next few weeks seem to be hard (exam period is coming), but I am going to find time to discuss my ideas with you, and ask your opinion. Hi, I am Daniel Butum (leyyin on #stk and github). I’m currently in my first year of computer science at the Babes Bolyai university in Cluj-Napoca, Romania. 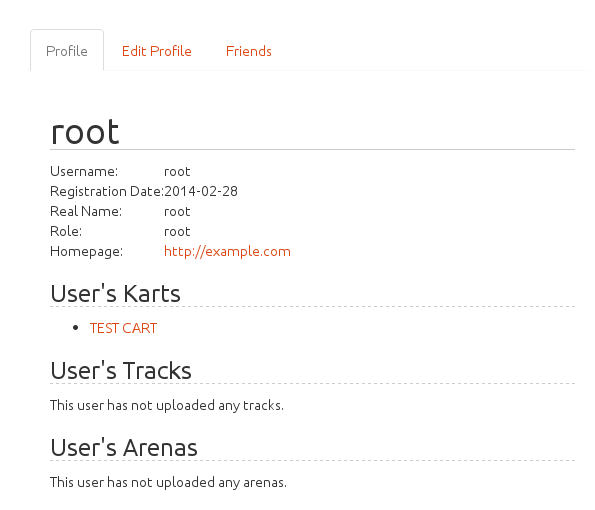 I will be working on the online user administration. Among the new features, the most important ones (that will be visible to regular users) is the possibility to report bugs on individual addons, new friend system (view, add, edit and delete friends from the stkaddons website; a crude early mockup http://i.imgur.com/tXIaxL5.png), viewing the users and addons (karts, tracks, arenas) will be simplified and easier to navigate (implement pagination and search), the possibility to post, play or comment anonymously (guest account), and of course achievements :) on the user page. Hello readers, I go by the nick nixt on IRC and my project is about Gameplay Improvements. The primary goal of this GSoC project is to allow driving on walls and upside down surfaces. This will allow artists to create much more engaging tracks which may incorporate loop-the-loop or twister-like sections. While it is realtively easy to implement this for player controlled karts, the current AI is designed around the idea of the tracks being mostly horizontal. So the main problem we are trying to solve is to improve the AI so that it can drive around such tracks with sufficient competence. Hopefully, by the end of GSoC we will have some really interesting tracks to play with! Hello everyone! My name is Sachith Seneviratne and I'm a 3rd year Computer Science and Engineering undergraduate at the University of Moratuwa, Sri Lanka. I absolutely adore programming for games, especially AI and scripting and I will be working on a new scripting engine for SuperTuxKart. The Engine will be implemented in AngelScript and will help in increasing the configurability of the SuperTuxKart codebase. The primary objective will be to create a lot of new fun interactions for karts and tracks. Hi, my name is Bart, aka solistice, and I'm accepted to work for STK on Gameplay Improvements. I'm 23 years old, and I live in Belgium. I’m going to work on two important features during my period here. The first one will be further implementation of the replay system. Internally, there has been some work on this, but my goal is to improve this. One of the new things will be an exportable replay file, that can be re-opened, and even raced against (in the form of a ghost race). When time allows, and networking is up to par, those replays could be spread online. The most important reason to do this, is so users can race against each other, and to fight against cheating. The top x best times could then have a replay automatically uploaded, and others can race against those replays. The other main change included in my proposal is the differentiation of karts. At the moment, every kart has the same properties (same weight, same max speed, turning, and so on). Changing this is as good as done, internally, but the GUI to support this and the balancing work is something I will work on. I have to make sure no karts are more powerful than others, yet make the difference between karts big enough to have a visible impact in the game. This way, kart selection is more than only selecting fancy images! When time allows it, support for different kind of vehicles (motorbikes and others) will also be implemented, but only if the other jobs are done! Interesting bunch, eh? And even more interesting will the new features be when ready, although this will naturally take some time to get mature enough for wider release. Meanwhile, relax, drink some fruity juice and enjoy the summer! In our days it is completely ridiculous if you cannot be able to use computer. If you need any kind of support while you are trying some new program it’s really easy to contact a lot of companies which are offering IT Consulting services. That’s why I checked out this guys http://www.xiitec.com . Highly recommended!